The best-known adventures of the Crandel Caravan - the Goblin lair in Harken, the Rescue at Rivenroar, the long journey to the Thunderspire and back - have all been small-scale, fairly private expeditions. However, it is not usually the case that the Caravan travels with a single cart and small load of cargo. It's actually much more common for the Crandel Caravan to conduct trips as a true caravan: several wagons loaded with both goods and people. 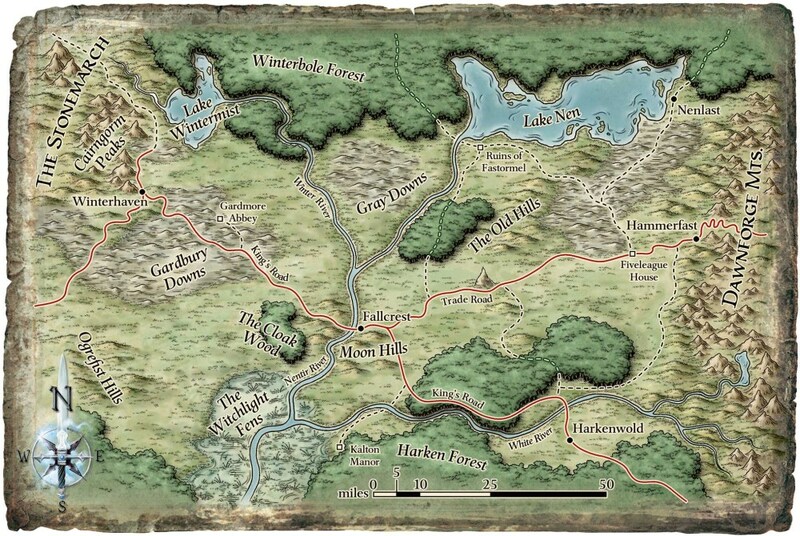 Such journeys are the only reliable way for non-adventurers to make their way from one town to the other in the Nentir Vale, as the roads are significantly less dangerous to larger groups of people. It's such a journey that your boss, Jebediah "Jeb" Crandel, is currently organizing. The destination is two days away: the farming community of Harken (that's right, the site of your first major adventure). You've spent the last week posting flyers around Fallcrest advertising open seats for passengers (200 gold per person; not exactly cheap, but realistic considering the state of the roads lately), and gathering up outgoing cargo from various familiar merchants. It is now the night before your departure. The four of you plus Tanya and Jeb are seated in the taproom of the Silver Unicorn Inn, your usual residence in Fallcrest. There's a good-sized crowd in the inn, as a fairly well known half-elf lutist is playing tonight. Jeb's filling you in on the finer details of the trip you'll be departing on in the morning. In particular, you're looking forward to hearing about the passengers - Jeb typically handles the arrangements for passengers directly, and hasn't yet told you about who's coming along this time. "Alright, y'all, I know you been dyin' to hear about what kinda passengers we got comin' with us. It's gonna be four people - two pairs of two, really. First two are..." *Jeb coughs loudly* "...a couple o'dwarves. Little bit uh, unusual lookin' for dwarves y'see, but they paid a lil' extra so it ain't no trouble". Most of you would get the gist of what he's saying - there are frequently "unusual looking" people trying to travel through the Vale, and if you turned all such people away, your group wouldn't have two coppers to rub together. Tanya frowns and furrows her brow. It appears this is one of the rare moments where she's genuinely perplexed by something. "Old friend? Really, who could that be...?" Jeb relaxes a bit in his chair, and takes a generous gulp of ale - he seems to be more or less done briefing you on tomorrow's trip. "Well, glad as I am about all that, I was hopin' we'd have more than just four passengers. After all, we're the only caravans headin' south, with Pendergast and Locheed heading east and west this month. Ah well, can't be helped at this point." "It's nice to take an easy job now and then, but hopefully we can wrap this up quickly. Not too much money to be made out in the boonies." Phaedra sighs and taps her drumsticks against the table in irritation, "Is this going to be another boring hay-ride babysitters club adventure? Why don't we ever go on caravans to the blood marshes? You know we could sell their blood crystals to the hell elves for a million shines right? We'd also have to kill most of them as an added bonus." Tanya stops with a spoonful of stew halfway to her face, "Umm... I a-actually read about the Blood Marshes, they're only so named for the blood-sucking mosquitoes that infest them. They're otherwise uninhabited. And if you're referring to Abyssal Elves, there was only ever one of them, and they-" She fumbles the spoonful of stew she'd been ignoring, mumbles an apology, wipes up what she'd spilled, says nothing else. Ignoring the blood elf talk Rasputin lifts his head back drinking bowl of stew in seemingly one gulp before waving his dishware at the nearest person to fetch him more. "Odd for dwarves to be heading in that direction boss." pausing to search his helmet for a bit of jerky his glances over his shoulder back towards jeb. "The others?" Chewing on a chicken bone, Ruth searches for even a morsel of meat left to satisfy her hunger. No surprise to the rest of the crew, she also lifts out her plate for a second helping. "Who cares as long as they're paying? As long as they're not bringing along any talking donkeys." Phaedra glares at Tanya, "You're talking about the Hellf? The Abyssal elf? We should be hunting that rascal down instead of shipping Gimli and Thorin down to the south pole..."
Jeb addresses Rasputin and Ruth, who are the only ones speaking directly to him at this point. "Well, I'd love to tell you what kinda business is takin' our passengers out Harken way - but you know we got a 'no questions asked' policy, which all four of 'em were happy to take advantage of. Important thing's I didn't reckon any of 'em would be much trouble - and I got near as good a nose for trouble as the rest of y'all." Pepe casually glances around the taproom, and notices that a seat near the stairs to the inn rooms is vacant, though he could have sworn there was someone sitting there just a moment ago. Ruth is also looking in that direction, seeming to have noticed the same thing. Phaedra has her attention fixed elsewhere. Specifically, she's the only one who noticed a person wearing a dark cloak, hood pulled up, who has suddenly appeared just a couple feet behind Jeb. Phaedra suddenly stands up, knocking a bowl of hot ham stew out of a wench's hands and onto a half-elf sitting at the table next to the caravan. She slaps her drum down on the table with one drumstick raised into the air over it. While pointing the other at the cloaked man, She barks out, "Hold it right there, tiny, you're about 20 steps closer to Tex (popular slang for the slow witted, drawling populace of the country of Texylvania) than you ought to be." The half-elf takes 2 points of damage from the hot soup, and lets out a loud yelp. The proprietess, Wisara, glares over from behind the bar and shouts, "Watch where you're spilling things Margie, that's the blessed lutist!" The cloaked man stops walking, and slowly raises two empty hands. He inclines his head a bit, face now catching some light, and you see that it's not a he at all - it's a woman. She looks at Phaedra with catlike bright-green eyes, gives a thin smile, and says, "I apologize. I shouldn't have approached so... subtly, with such an alert group here. I merely wish to discuss business." She takes a step to the side to more easily converse with Jeb, who'd had to quickly look over his shoulder to see what all the commotion was about. "Business?" he says. "Indeed," says the woman, just now lowering her hands, "did I hear you say you were going to Harken? If so, I would like to make arrangements with you, good sir." "Well," begins Jeb, but the woman cuts in, "in private, if you don't mind." She delicately points toward a darker corner of the taproom, where a table with two chairs sits vacant. Jeb glances back to the rest of you, and shrugs. What do y'all have to say? Rasputin stands and starts stomping towards Jeb. Once he is behind jeb on the other side of the woman he simply folds his arms and waits. Keeping the boss out of situations of rising tensions and tricks of thieves has always been his business. Rasputin attempts to spot any weapons on the woman such as daggers or other sneak thief nonsense before he steps in any further. The mystery woman's long, dark cloak comes back a bit as she points to the empty table. She is dressed in relatively plain traveling clothes. Rasputin notices a medium-length dagger with a curved blade hanging at her side; she wasn't deliberately showing it off, but didn't go to much effort to hide it, either. You don't see signs of her having any other weapons on her person. She glances up to meet Rasputin's eye (her being at about average human height), but gives no change of expression. Glancing back and forth between the mysterious woman and Rasputin, Ruth bites down on her bone absent-mindedly. It crackles, filling the staring contest with awkward munching. Pepe also tries to visually assess what kind of danger the woman might pose. ( d20+2 = 16 ) But unless he spots something alarming, he trusts Jeb to be able to handle his own business. Phaedra settles back into her chair and relaxes a little. She sizes up the stranger (pint-sized) and takes her demeanor into consideration. Phaedra hasn't been the bar-dwelling type until recently, but she has an ear for a good story, especially one of treachery over money. Phaedra tries to remember if she has heard anything about a cloaked stranger up to shady dealings going around lately. Int Roll: 1d20+3 = 10.